Cubital Tunnel Syndrome occurs when the ulnar nerve (or “funny bone”) that passes through a bony groove behind the inner part of the elbow becomes compressed or irritated. The groove for the nerve is covered by ligaments, which can become too tight and not leave enough room for the nerve. In some people, the ulnar nerve is unstable and can move out of its groove and snap back and forth over the bone on the inner part of the elbow. This can also cause irritation of the nerve. Numbness and tingling in the little finger and sometimes the ring finger are common symptoms, because the ulnar nerve provides sensation to this part of the hand. Weakness of the hand may be present in more advanced cases. Pain at the inner part of the elbow may also occur. Keeping your elbow bent a lot causes increased pressure on the ulnar nerve, so the condition is seen frequently in weightlifters and baseball pitchers. People with diabetes are also at increased risk of developing Cubital Tunnel Syndrome, probably related to their less elastic ligaments. Anyone, though, can develop this condition with tightening of the ligamentous cover to the cubital tunnel that may occur with age in those anatomically predisposed because of less space around the ulnar nerve. 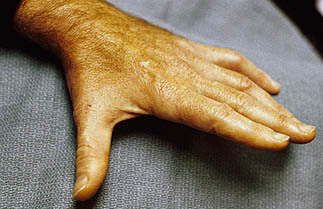 Speaking with you to understand how your hand feels and which fingers in particular are affected is very important. The physical exam is also central to making the diagnosis, as there are several special tests that are performed to evaluate for nerve irritation. A nerve test (NCS) is routinely obtained to provide details about the health of the nerve and its performance. By placing sensors on the arm and hand, the test will localize the site of compression and quantify the severity of the injury to the nerve. For mild cases, treatment with anti-inflammatory medication, intermittent splinting (usually at night), and ergonomic modifications to avoid excessive bending of the elbow may relieve the symptoms. More severe or longstanding symptoms, representing more serious nerve compression, usually indicates surgery to decompress the nerve. By relieving the pressure on the nerve the goal is to avoid further injury to the nerve and allow for recovery. In cases where the ulnar nerve is moving out of its groove and snapping back and forth the nerve can be moved during surgery to the front of the elbow where it is stabilized after the decompression. Cubital Tunnel Syndrome can cause permanent damage to your hand if not diagnosed promptly and appropriately treated. Call Dr. Pruzansky at 212-249-8700 to schedule an appointment and start caring for your nerve.